The authors take an in-depth look at familial struggles in the workplace and it becomes apparent that running a family business requires a unique set of skills. Decisions driven by deliverables and the bottom line do not always equate well with the role that emotion plays in family-run businesses. 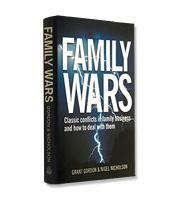 Family Wars offers observations and solutions. Rivalry. Intrigue. Jealousy. Malice. These words easily highlight the plot descriptions of works as lofty as those by William Shakespeare or as common as the daily lineup of afternoon soap operas. Unfortunately, for a portion of the corporate world, devilish divisions and bitter infighting are business as usual. These are the issues that can make an ordinary business fraught with problems. But this is no ordinary business. This is family. Fortunately, authors Grant Gordon and Nigel Nicholson ride to the rescue with Family Wars: Classic Conflicts in Family Business and How to Deal With Them, an in-depth look at familial struggles in the workplace. The passing of a company from parent to child has remained an essential backbone of the global economy. Craftsmen have historically ensured that their unique trades and skills are perpetuated beyond their own life spans by bringing the next generation in early. Many major corporations have their roots in a single family that shepherded the original business through good times and bad. Family-run businesses will always be essential to the continued development of new ideas and services. 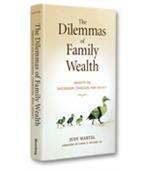 But the authors’ true concern is with the darker side of multigenerational businesses. There are natural downsides that can result from several decades of a business under the same last name if the ownership is not careful. Gordon and Nicholson expertly name and number the problems unique to family-run businesses, but –– more than just labeling –– they also offer insight and solutions. As much as it fits the business book moniker, Family Wars could easily sit on a shelf in the psychology section of any bookseller. Family business is not “just business,” the authors indicate time and again. The cold, calculating world of decisions driven by deliverables and the bottom line does not equate exactly with the bloodline business. Emotion creeps its way into decisions, in many cases without the ownership even realizing. For example, the brashness of a young executive can cause a company to lose a long-time customer and a significant revenue stream. Ordinarily, a business owner could evaluate the situation, reprimand or dismiss the executive and steer the company back to calm waters. Does the owner view the situation differently if that executive is his or her son or daughter? Gordon and Nicholson would argue yes. Family Wars serves as a cautionary tale for executives who run, are partners in or may inherit a family business. Many readers will find that the multitude of examples provided by Gordon and Nicholson resonate deeply. The issues of family, be they jealousy and competition between two siblings or chaos and disorder in the wake of a parent’s death, are universal experiences. It’s preventing those issues from clouding one’s ability to execute smart organizational and strategic moves that remains the issue. What may surprise readers is the absolute star power of the examples provided by the authors to illustrate their points. There are few businesses mentioned in Family Wars that the reader doesn’t encounter on a weekly basis. The success that these companies have experienced despite internecine practices will only lead one to wonder what greater heights these companies could have reached. The reward for reading Family Wars comes with the book’s concluding chapter. The authors pull no punches during their evaluation and statement of the lessons that patriarchs and matriarchs should remember. Again, the fact that emotion plays the role it does in family business means that much of what the authors reveal may not be comfortable to read. Yes, the word “nepotism” does rear its head, but so does a five-point strategy for keeping it from ruining one’s company. Multigenerational battles, division of an estate, brother vs. brother conflict and even the problems of an aging executive’s unwillingness to let go are all given careful and concise treatment. It becomes apparent that running a family business requires a unique set of skills that are not available in lecture halls or advanced degree programs. Perhaps this is why the authors include this quote from American writer and clergyman Charles Swindoll: “A family is a place where principles are hammered and honed on the anvil of everyday living.” Family Wars is the best attempt yet at creating a guidebook of ways to prevent the hammer from falling too heavily on family businesses.